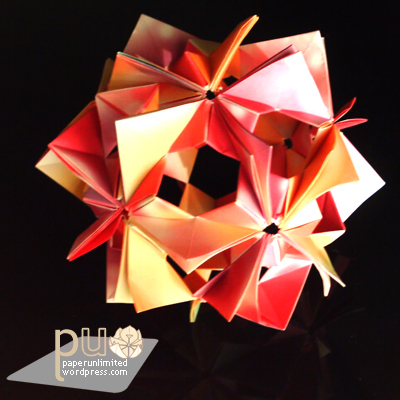 This one is currently my favorite kusudama (along with the mosaic box). Very pretty and delicate, no glue required. The only troublesome thing is the assembly. It requires some patience: the last units were devastating but the overall result made me forget all the trouble I had. The above picture is before curling. Or to be more accurate after trying to curl and failed because all my pens were to large. Bellow it’s the curled version with the brush I used to curl it. It’s a number 0 (zero) brush from da vinci and since it’s slightly conical it’s still a bit troublesome to curl the stamens with it. I will definitively do the arabesque bigger and in other colors and will also try the other arrangements. But I’m so short of time now :( between cutting the paper for the kusudamas, folding and assembling it’s generally a month or more. 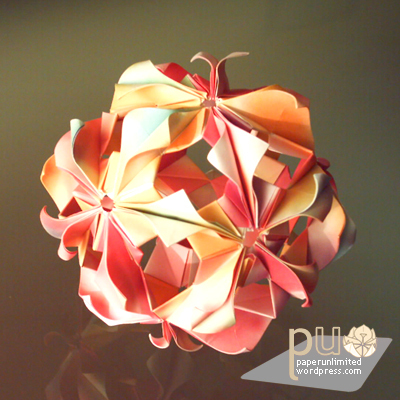 This kusudama was made with 30 units of origami paper, 7.5×7.5 cm, and when assembled has a diameter of approximately 10 cm. If you use origami paper, wrapping paper or kraft paper 7.5×7.5 cm is a good paper size but if you plan using heavier paper, like colored copy paper, I advice you to try with 12 or 15 cm square paper. 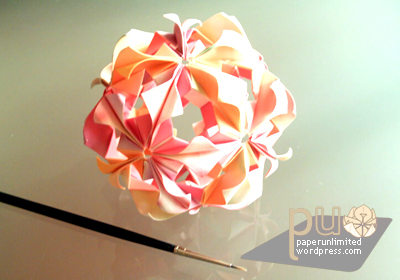 This entry was posted on 2007|01|31 at 17:58 and is filed under kusudama, modular origami. You can follow any responses to this entry through the RSS 2.0 feed. You can leave a response, or trackback from your own site. Is there any instructions on how to make it? or could you send me some?